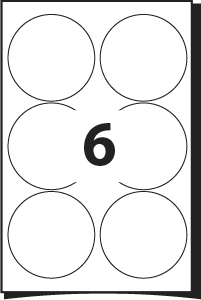 There are 6 round labels per page with each label being 95 mm wide and 95 mm high. There is a 6 mm gap between the label rows and 2 mm gap between the label columns to determine whether you can create your design with bleed or not. Whilst producing the design, due to printing restrictions on digital presses, you must consider that there is a 4 mm margin on both top and bottom of the sheet, and 7 mm margin on left and right hand side of the sheet. Please read your printer manual carefully as each printer has a printing tolerance of up to 2mm. You must accommodate this tolerance by producing your design with enough bleed and/or leave enough gap between the label contents and the label cut line. There are 2 round labels per page with each label being 117 mm wide and 117 mm high. There is a 0 mm gap between the label rows and 20 mm gap between the label columns to determine whether you can create your design with bleed or not. Whilst producing the design, due to printing restrictions on digital presses, you must consider that there is a 21.5 mm margin on both top and bottom of the sheet, and 46.5 mm margin on left and right hand side of the sheet. 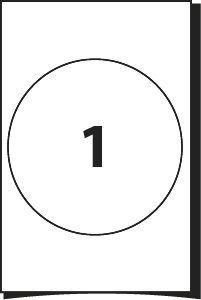 There are 2 round labels per page with each label being 140 mm wide and 140 mm high. There is a 0 mm gap between the label rows and 3 mm gap between the label columns to determine whether you can create your design with bleed or not. Whilst producing the design, due to printing restrictions on digital presses, you must consider that there is a 7 mm margin on both top and bottom of the sheet, and 35 mm margin on left and right hand side of the sheet. There are 1 round labels per page with each label being 200 mm wide and 200 mm high. There is a 0 mm gap between the label rows and 0 mm gap between the label columns to determine whether you can create your design with bleed or not. Whilst producing the design, due to printing restrictions on digital presses, you must consider that there is a 48.5 mm margin on both top and bottom of the sheet, and 5 mm margin on left and right hand side of the sheet.